A criminal always leaves a trace of evidence behind. Become a CHFI with EC-Council’s online course on CHFI certification. 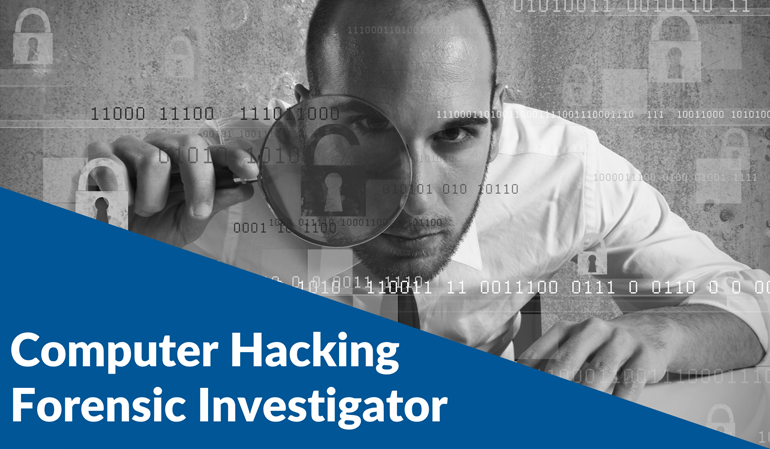 This online training course certifies individuals in forensic security discipline from a vendor-neutral perspective and enhances their knowledge on digital forensics to investigate and prevent cyber attacks efficiently. Computer hacking forensic investigation is the process of detecting hacking attacks and properly extracting evidence to report the crime and conduct audits to prevent future attacks. Cyber crime investigation process, including search and seizure protocols, obtaining search warrants and other laws. Cyber crime categories, digital evidence types, rules of evidence, and best practices in computer evidence examination. First responder duties, conducting and documenting preliminary interviews, securing & evaluating computer crime scenes. Forensic investigator tools of the trade, collecting & transporting electronic evidence, and cyber crime scene preservation. Recovery of deleted files and partitions in popular computing environments, including Windows, Linux, and Mac OS. Utilizing Access Data Forensic Toolkit (FTK), EnCase Steganography, Steganalysis, and Image File Forensics. Password cracking concepts, types of PW attacks, latest tools and technologies to decipher password breaches. Computer security log capture tools, log analysis methods, time clock synchronization and event correlation. Identify, track, analyze and defend against the latest and nastiest Network, Email, Mobile, Wireless and Web Attacks. How to provide effective expert witness testimony in cyber crime trials and legal proceedings, and much more.